The Toothboss has been around since 1992. In reflecting on what it means to be in practice for 25 years, I thought about the many patients have been with us since the beginning. Then another revelation occurred to me: many of those patients were patients of Dr. Armen Nalbands, the dentist who owned practice prior to The Toothboss. I thought, “they ought to get a medal for something like that.” That’s when we came up with the idea of The Toothboss Hall of Fame. The Toothboss Hall of Fame features patients who have been with us for 30 years or more. While we appreciate all our patients, we are very grateful to people who have been with us that long. To show our appreciation, we have put together a small gift bag as a small token of our gratitude. 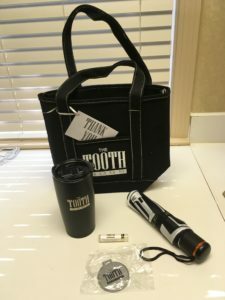 It includes The Toothboss tote bag, an umbrella, a travel mug and a few other things. Thank you, again for your decades of patronage. Look for upcoming posts with photos of new “inductees” into The Toothboss Hall of Fame.